Need an easy, healthy, and comforting soup recipe? 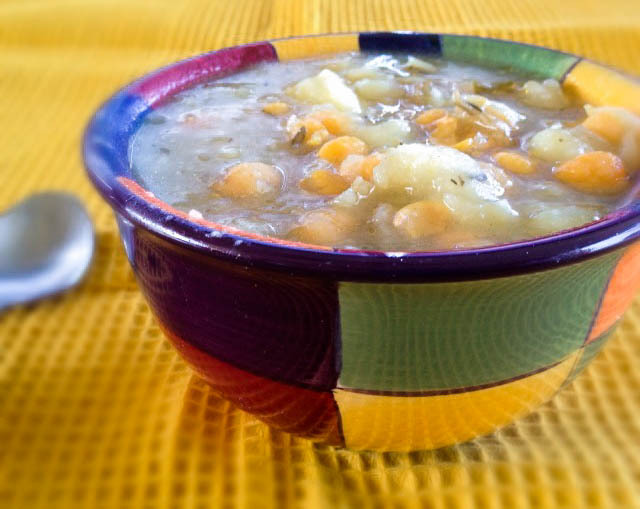 This crock pot potato stew recipe is just what you're looking for. The chickpeas compliment the potatoes and lend a savory flavor, while the fresh herbs and chives add just enough green to this dish. Total Cook Time: 2 hours and 45 minutes. Add all ingredients to a crock pot. Stir, and cook on high heat for 2 hours, stirring occasionally. After 2 hours, mash the potatoes a little (but not all the way) with a potato masher. Reduce heat to low, and continue cooking for another 20 to 30 minutes, stirring when necessary. There is so much great flavor in this! Truly the ultimate comfort food.